They don’t teach this in universities, but our economy is a macho dude who is cocky and aggressive. The global economy has largely been designed and executed by men. Naturally, their neurobiology and leadership qualities have influenced the shape of modern systems of exchange. There have been striking similarities in the responses from most of my clients who were asked to imagine money as a character. They saw a masculine character, sometimes a thin, stingy old man or an obese wasteful one, but definitely masculine. Need more proof? Imagine the testosterone in the competitive pit of the New York Stock Exchange. What type of behavior is being rewarded there? How could we bring balance with a feminine economy? 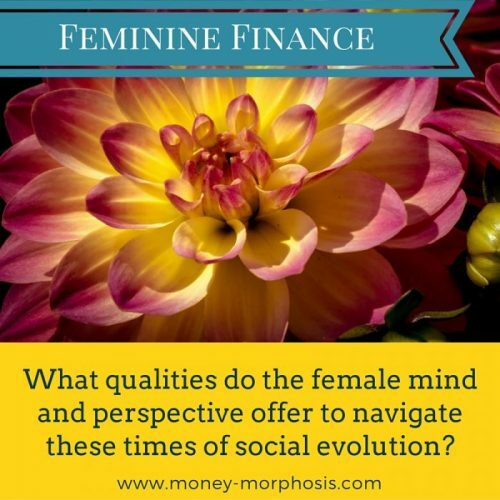 What qualities do the female mind and perspective offer to navigate these times of social evolution? This is about balance, not exclusion. It’s not that human characteristics are absolute; each quality can certainly be measured in people of either gender, and often the good or bad is in the measure, itself. So, what if we organized our exchanges and managed our resources in ways that had qualities that were more feminine? What are those qualities anyway? As explained by neurobiologists there are certain brain activities and perspectives that differ between the sexes. These masculine and feminine tendencies are expressed through each of us and in every system of human design. According to research in evolutionary psychology, there are differences in male and female human brains. So, naturally, in this modern patriarchy predominantly with men in positions of power and influence, our systems reflect more masculine traits. These scientists find that female and male brains developed differently to adapt to their respective roles. Both qualities are advantageous and can work together synergistically. In this reductionist view, the world is a machine and time is divided by minutes and hours and measured by dollars and cents. In a more feminine perspective, the value is placed primarily on the invisible web of relationships instead of on the individual parts, and the network of connections is emphasized. According to a recent Stanford study, men and women cooperate differently and are more effective and reach coherence with different conditions. For example, women perform best when being witnessed by one other woman, while men cooperate better in large groups. Modern systems of education have rewarded intense specialization. Many modern business employees are not given a whole picture of the organization. With a more feminine skill of holopticism (seeing the whole picture), open communication and transparency are valued. For instance, on average, men are more likely to be better at learning and performing a single task at hand, whereas women have superior memory and social-cognition skills, making them more equipped for multitasking and creating solutions that work for a group. By nature of her menstrual cycles, the woman’s body exists in a unique rhythm of fertility. Men are more linear, direction-oriented thinkers, achieving goals. Women are more naturally in tune with the larger cycles of childbearing and rearing. The man’s brain tends to have greater activity from back to front, planning into action. The woman’s brain has more activity between the two hemispheres, integrating intuition and logic. The female brain is characterized by empathy—the ability to feel and understanding the feelings of another, to predict behavior, and to connect or resonate with others emotionally. The male brain tends to “systemize,” a drive to analyze, explore, and construct a system. The systemizer intuitively figures out how things work or extracts the underlying rules that govern the behavior of a system. The purpose of this is to understand and predict the system or to invent a new one. Feminine finance is already happening. Look at the economy of mothering; this service is done without measurement, is in the gift economy, and is one of dependence and obligation. Currency expert Bernard Lietaer explains the need for both a yin currency and a yang currency operating simultaneously to fulfill different purposes. National currency is yang—it encourages competition, rewards having and doing, is based on logic and linear thought, and relies on a central authority. Complementary currencies, bartering, and gifting are yin—they are used within a community to encourage cooperation, building relationships and local exchanges based on mutual trust. Look at the Mutual Aid Network as an example. The time is ripe to bring more of these feminine qualities into the design of our exchange and currency systems. Honoring and embracing our differences brings resilience and vitality to our human systems.